There’s no better way to unwind after a long day of meetings or exploring than to take advantage of Crowne Plaza’s amenities. With our guests in mind, our amenities have been specifically designed for both the business and leisurely traveler. As a hotel in Indianapolis with an Indoor Pool, this is just one of the well thought out amenities guests can take advantage of. Indianapolis, Indiana is on its way to becoming a top dining city in the U.S., and our hotel is proud to feature two distinct dining options complete with delectable cuisine. Crowne Plaza offers two on-site restaurants, 123 West, open weekdays from 6am-11am. On weekends, it operates as Crowne Plaza’s Breakfast Restaurant, and is open until 12pm. Taggart’s is our second on-site restaurant and offers lunch, dinner, and drinks. Open from 11am-11pm and weekends from 1-1:30pm, guests can dine and then party the night away. Room Service is also available from 6am-11pm each day. All dining options offer American style food options. 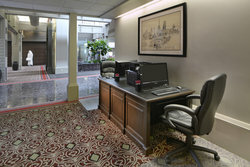 Crowne Plaza is the premier choice for those traveling on business or those attending weddings and social gatherings. Our hotel offers over 55,000 square feet of meeting and event space. Our versatile spaces include 22 meeting, functional exhibit, and ballroom space, with the largest room capacity accommodating up to 800 guests. Our largest and most popular room, The Grand Hall, offers a luxurious space perfect for weddings and is considered the top venue in the city for events. All rooms include complimentary Wi-Fi, and rental options if needed. Some rental equipment includes, 35mm slide projector, digital projector, LCD projector, and much more! Book your stay at our hotel in Indianapolis with an indoor pool, on-site restaurant, and tons of other accommodating amenities! 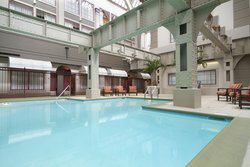 Our hotel in Indianapolis features an indoor pool, perfect for your next getaway! Open from 9am-10pm daily, we encourage guests to take a dip after a long day of meetings and exploring. Stay connected at our 24/7 business center, fully equipped with copier, printer, scanner, and complimentary Wi-Fi, with additional services provided if needed. Guests can stay on top of their workload and preparation for meetings. Looking for additional services? Our friendly and helpful front desk/concierge staff can recommend further local businesses based on your needs. 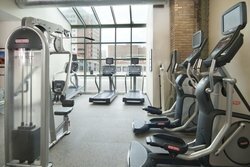 Stay fit and don’t give up your daily exercise routine when staying at Crowne Plaza Indianapolis Downtown. Featuring a 24/7 fitness center fully stocked with 4 treadmills, bicycles, elliptical, free weights, bands, and mats, guests can fit in their daily exercise anytime of the day or night.